Douglas Atherley, who established Kinari Designs in London, worked in banking in London, New York, and Tokyo before turning to a career in design. 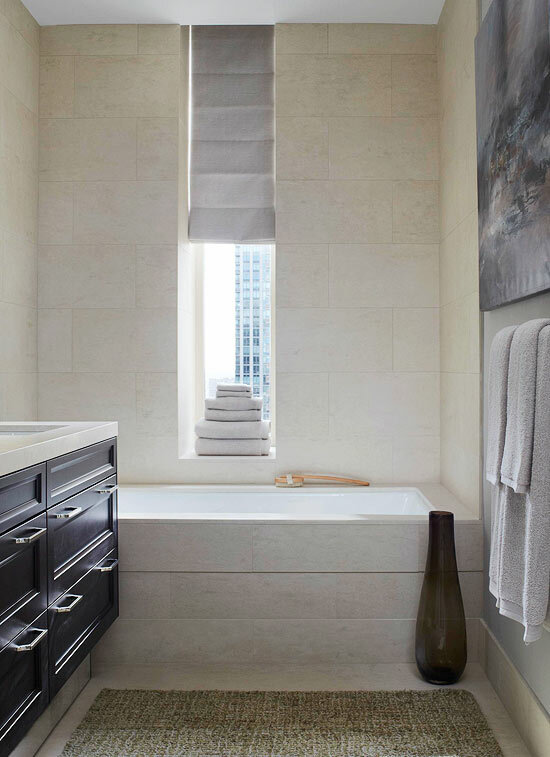 Doug makes the most of an elegant apartment in Chicago’s Ritz-Carlton Residences. Sitting high above Chicago’s Michigan Avenue, it’s sunny by day with red and orange accents that enhance sunsets. At night, it’s cocooning. Here, he discusses the inspirations, challenges, and techniques that went along with his design. TH: What was your inspiration for this apartment? DA: I had twenty years of banking in London, New York, and Tokyo, and many of our interior design clients are based in that world. Chicago is a city I used to visit a lot. When I lived in New York, I would come here every month. It’s obviously a big financial community and an international city. The location and name of this building lent themselves perfectly to the idea that this would be an apartment which would appeal to an international businessman or businesswoman, or maybe a family space, a professional couple with one child. So the idea was to look at something that would suit that kind of international background. One thing we found with the work we do around the world, though it changes based on where we are, is that there are still certain constants. Of course there are local differences, but the overall vibe and aesthetic are somewhat similar. Being on the 26th floor, above Michigan Avenue, looking at the sunsets that you get in here—we took that as the direct theme for the apartment. But essentially the overall look is international contemporary, a soft but still quite strong look. TH: What challenges were you faced with based on the original layout of the apartment? DA: We saw some changes from when we first looked at the plans, which meant changes to the kitchen, changes to the bar area. We were faced with a dividing wall between the living and dining rooms. I think the layout was essentially always going to be the same—that was always going to be the dining space. The realization that we had this big archway enhanced the overall design, in that you have a very open dining area but it’s still slightly separated. The thickness of the walls meant that we were able to put in a completely flush bookshelf, which matches a desk on the other side of the arch, so there’s a little bit of a study area. It’s a sizeable apartment, but not massive. We’ve managed to get into the main living area, a very separate and distinct dining area with sideboard and serving areas, and quite a large open-plan living area with a desk and bookshelves. We’ve also got the bar area, which we’ve left open because we couldn’t cover up the air conditioning ducts. We’ve dramatically changed everything: a completely new kitchen, completely new work tops, to make it a little bit less obvious as a bar area in the living space. As it was, it had looked a little too much like part of the kitchen, so we made it a bit more glamorous. TH: How did your design reflect your original inspiration? DA: We have a quite a lot of shiny surfaces. We brought that into the kitchen with Mick De Giulio’s new line, and with the glossy, dark ebony wood, it picks up the polished plaster in the living room. It all comes back to the location, the sunsets, and the light that you get in this apartment. We have lots of surfaces that will help subtly reflect the light and bounce off the warm colors of the sunset. That works with the colors that we’ve chosen—we picked up a lot of the reds, the oranges, the colors of the beautiful sunset. The idea is that it’s quite a soothing apartment. 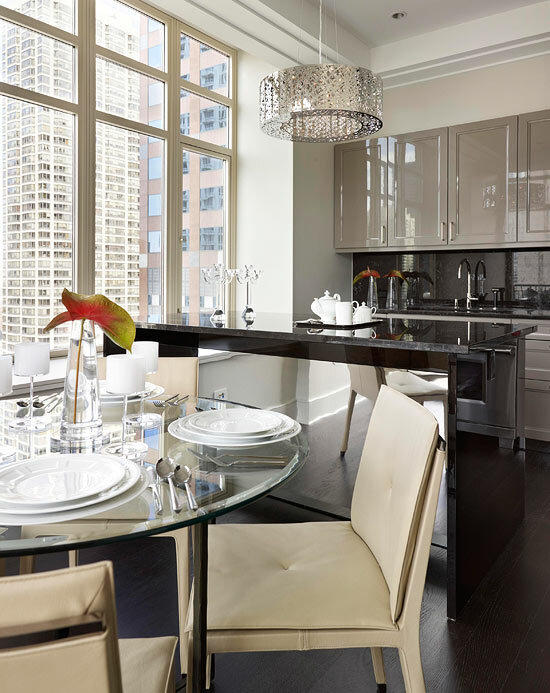 There are strong colors and surfaces, but when you walk in, and you’re 26 floors above Michigan Avenue, away from the hype of the big city, it becomes a bit more cocooning, a bit warmer, a bit more comfortable. We get good light in all the rooms, so actually in the daytime it’s a bright, sunny apartment. As for some of the big items, the desk is polished stainless steel and ebony, which means again a lot of reflection from that. The main furniture item in the living room, the sofa, is a bright creamy white color—nothing too heavy. The idea was not to make it too enclosing. TH: This apartment is livable as well as stylish. How did you incorporate functionality into your design? DA: I always have a slight problem with televisions, though they are getting a whole lot more attractive with some of the modern flat screens. But still, where do you put it? It’s difficult to find an elegant way for them to disappear. Cabinets that they go into often end up being too chunky—the whole process is still not yet refined enough. I wanted this television to blend in, rather than have a black screen in a light surface. But then the idea was not to have a big block of dark color, so the polished plaster gave us a dark color with a lot of texture and pattern in there. It is quite subtle, but it tends to disguise the TV without being too distracting when you’re actually watching it. To break up the wall, we brought that area out about six or nine inches in order to hide the cables and things that go behind the TV. That, along with the bench, gets some architectural lines there. At night it’s quite warm and lovely, and it adds interest to the wall. TH: The whole apartment carries your classic contemporary style. In what ways were you able to execute this modern look? DA: The Kinari name comes from a Japanese Zen concept, which basically means making beautiful things with natural materials and clean lines. We try to simplify. For example, we decided to build an architrave between the living and dining rooms matching the dark wood floor and built-in bookcase with very modern, contemporary lines. Very clean, very simple. It’s not cluttered, and there aren’t tons of accessories around—it’s the way I tend to want my house to be, even with two kids. We look at storage, we look at trying to make it a relaxing space that is not overly designed. 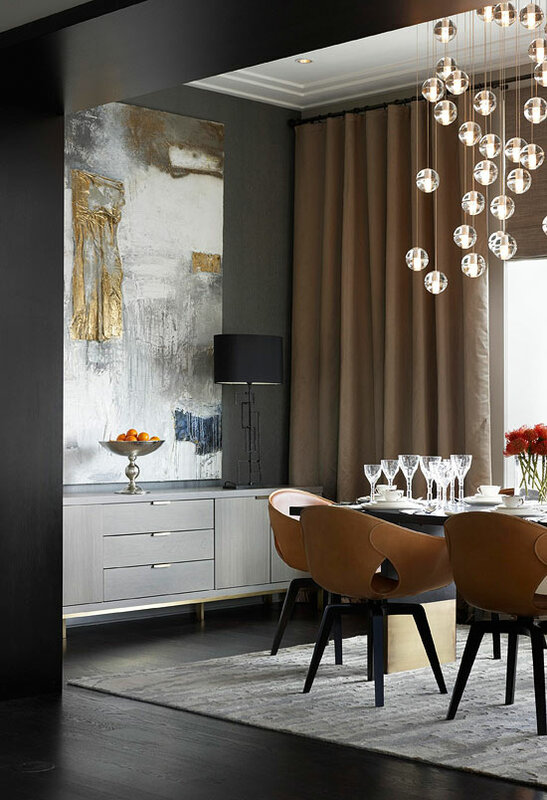 TH: Transitioning from the living to the dining room, there seems to be a subtle thematic difference. How did you accomplish this? DA: There’s actually quite a Dutch theme running through the dining room. The table and the sideboard are both custom made by a company in Holland, and the art that we chose is by a Dutch artist. We have a small breakfast table in the kitchen, so we did look at how that space might be used—it just lends itself so naturally to being a dining room. And given the idea of how we thought the space would be used, and who would use it, one could assume that there would be some entertaining. So we lightened the tone of the wood, a little bit lighter than the floor. But it’s all quite subtle, muted earthy tones. We didn’t want to take it too far away from the living area in terms of concept, but we warmed it up with the art. 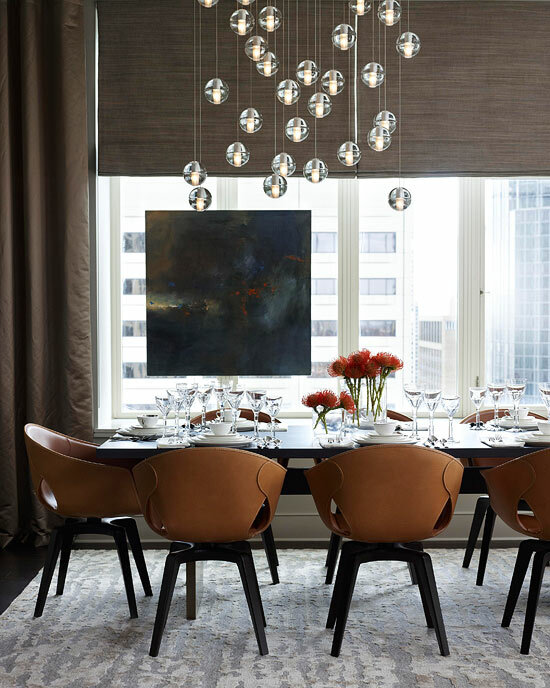 Whether in the artwork, the leather on the chairs, or the flowers on the table, that red-orangey color comes through that lightens up the dark browns without going to bright colors and harsh contrasts. TH: How did you accomplish the same variety in the master bedroom? DA: The master bedroom is a little bit softer. It has a more taupe palette. It’s not a huge space, but it has everything you need to feel comfortable. A lot of the bedroom goes to textures: the bed covers, the headboard, the fabric covering on the walls, and the carpet as well. We’ve been through a whole phase over the last few years where a lot of bedrooms we’ve done had wooden floors and rugs. 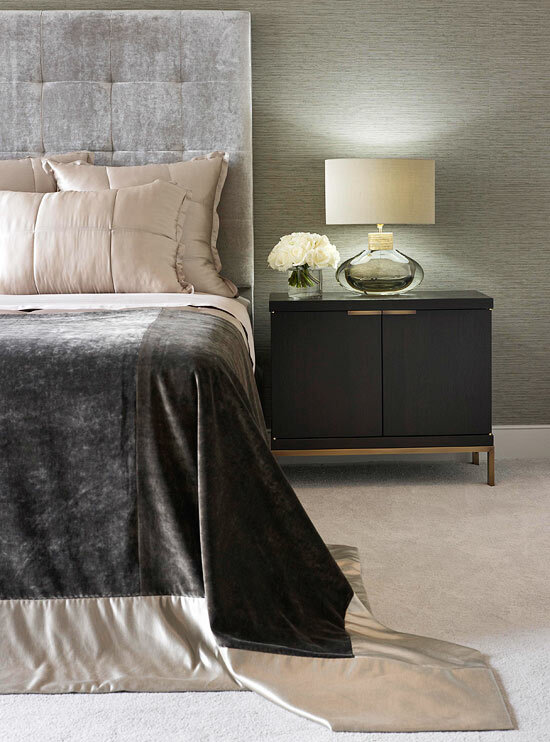 Increasingly over the last year or so, it’s moving back to plush carpets in bedrooms, a nice warm feeling as you get out of bed. Again, the room is not overly designed. The range of the colors is quite restricted, but with enough variation. A lot of the effort has gone into working with textures. The fabrics are beautiful, and there’s a lovely yet subtle sheen to some of them. It picks up again the theme of reflection. Builder: Prism Development Co., 625 N. Michigan Ave., Suite 500, Chicago, IL 60611; 312/782-6700, prismcompany.com. Interior designer: Douglas Atherley, project designers: Kristina Curtis and Liz Williams, Kinari Design Ltd., 23/1 Sheffield Terrace, Kensington, London, W8 7NQ, UK; 011 44 207 221 9569, kinaridesign.com. (doug@atherleydesign.com/ Kristina Curtis, kristina@atherleydesign.com). 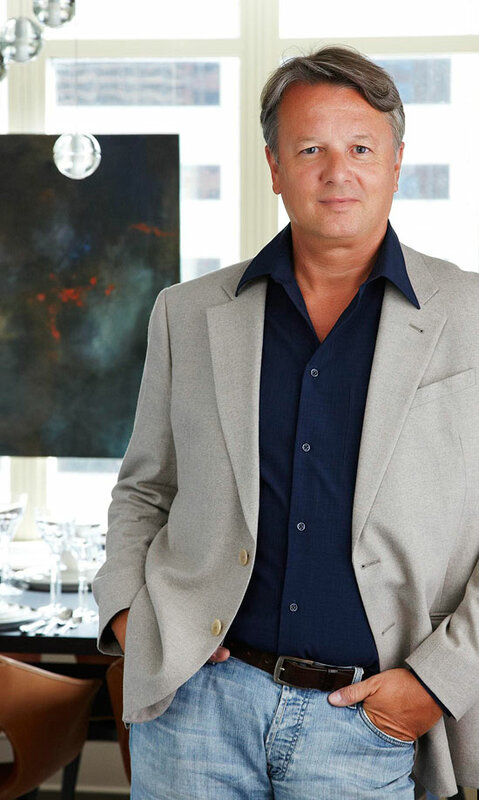 Kitchen designer: Mick deGiulio, De Giulio Kitchen Design, 1121 Central Ave., Wilmette, IL 60091; 847/256-8833, degiulio.org. Sofa (“Anderson Slim”); chair (“Atlan”): Minotti, 212/685-0095, minottiny.com. Wrap-around sofa cabinet (custom design by Jerry Nosai): Kinari Design Ltd., kinaridesign.com. Coffee table (“Angulus”); console table by window: Decorus, decorusfurniture.co.uk. Area rug (“Mohair Sable” #2098): The Rug Co., 312/379-1700, therugcompany.info. Window treatments (custom design by Doreen Scott): Kinari Design Ltd., kinaridesign.com. Drapery (“Lunar”/Tungsten #Z162/07, by Zinc): Romo, 800/338-2783, romo.com. Roman shades (“Caravanserail” #LI528-72): Elitis, 800/916-2036, elitis.fr. Paint (“Shenandoah Taupe” #AC-36): Benjamin Moore & Co., 888/236-6667, benjaminmoore.com. Art by fireplace (Springtime, by Joost Beerents): Cadogan Contemporary Gallery, cadogancontemporary.com. Television wall: Faux Design Studio, 630/627-1011, fauxdesignstudio.com. Doug Atherly was assisted in this project by his team in London, Kristina Curtis and Liz Williams. He draws on both Asian and Western influences to create an elegant, unfussy style. 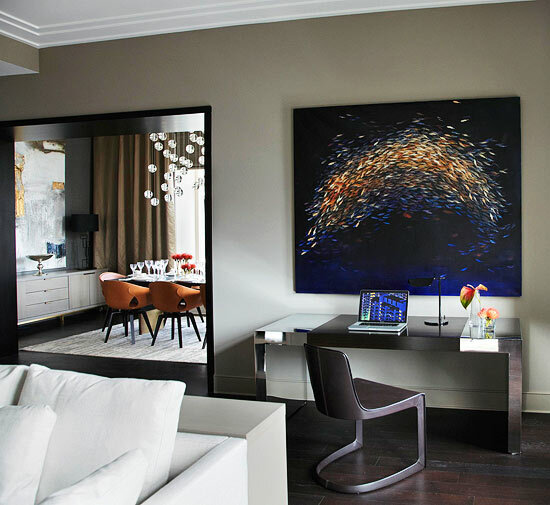 The desk in the living room is stainless steel and ebony, chosen in part for their reflective qualities. Desk (“Mirror Stainless Steel Desk”): Jonathan Baring Modern Classics, jonathanbaring.co.uk. Desk lamp (“Tab”): Flos, 212/941-4760, flosusa.com. Through WPA Chicago, 312/335-3855, wpachicago.com. Desk chair (“Twombly”): Minotti, 212/685-0095, minottiny.com. Art over desk (custom, Leaping Midnight Shoal, Nicola Bealing): Cadogan Contemporary Gallery, cadogancontemporary.com. Doug made good use of space by building in shelving behind the sofa. This helps to achieve the uncluttered look he likes. The living room’s bar area is convenient and sleek. 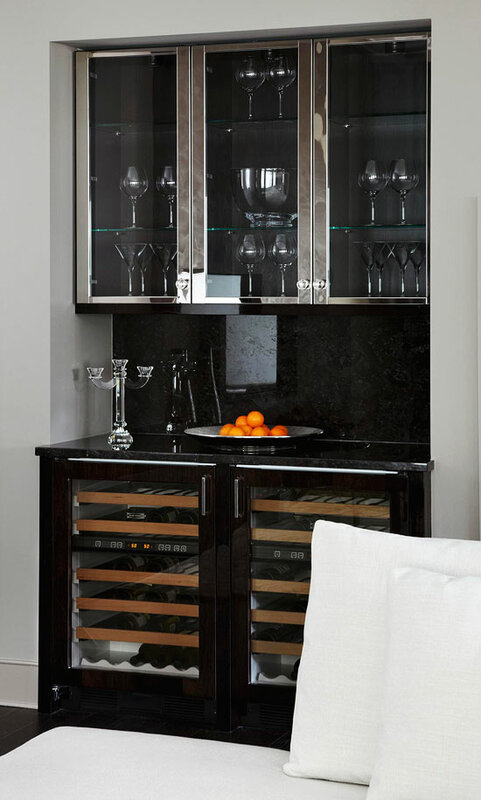 Bar (De Giulio Collection/ebony walnut gloss with polished stainless steel wall cabinet doors with clear glass inserts, ebony walnut interiors and crystal knobs); hardware (polished nickel): De Giulio Kitchen Design, 847/256-8833, degiulio.org. Orange hues in the painting Leaping Midnight Shoal by Nicola Bealing segue into the dining room with its handsome orange chairs. Table and sideboard (“Nota Bene”): Van Rossum, vanrossummeubelen.nl. Dining chairs (“Ginger”): Poltrona Frau, poltronafrau.com. China (“Crescent White” by Pickard China); flatware (“Alibi 2” by Christofle); crystal (“Heritage” by Baccarat); linens (“Tile”): Bloomingdales, 1.bloomingdales.com. Area rug (“Streets of Paris”/Walnut): Tufenkian, 312/329-9705, tufenkiancarpets.com. 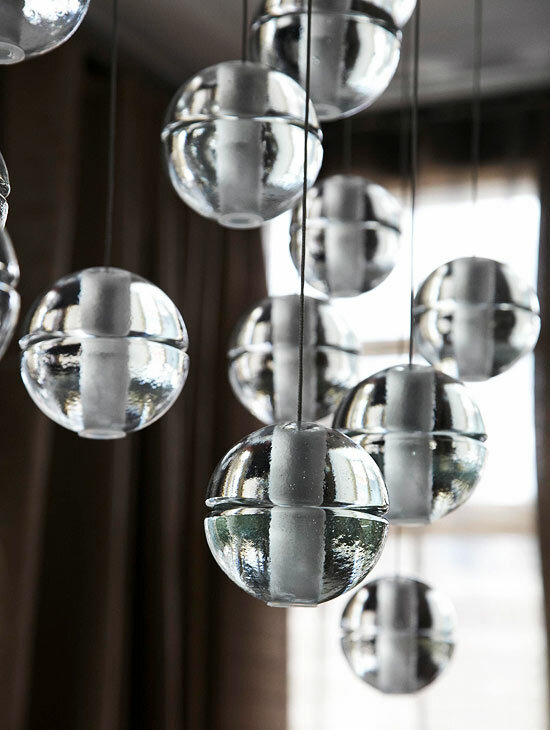 Chandelier (“14.36 Rectangle”): Bocci, bocci.ca, through Luminaire, 312/664-9582. Art on window (Fragments of Fire, by Janette Kerr); painting over sideboard (Goldplay, by Joost Beerents): Cadogan Contemporary Gallery, cadogancontemporary.com. Table lamp (“Salperton Lamp, Large”/Bronzed #SLB47L, with black shade): Porta Romana, portaromana.co.uk, through Donghia Chicago, 312/706-7071. Drapery (“Lunar”/Driftwood #Z162/05, by Zinc): Romo, 800/338-2783, romo.com. Paint (“Valley Forge Tan” #AC-35): Benjamin Moore & Co., 888/236-6667, benjaminmoore.com. Flooring (white oak, Oleostrong finish with UV-cured acrylic): Margaritelli by Listone Giordano, listonegiordano.com/usa. 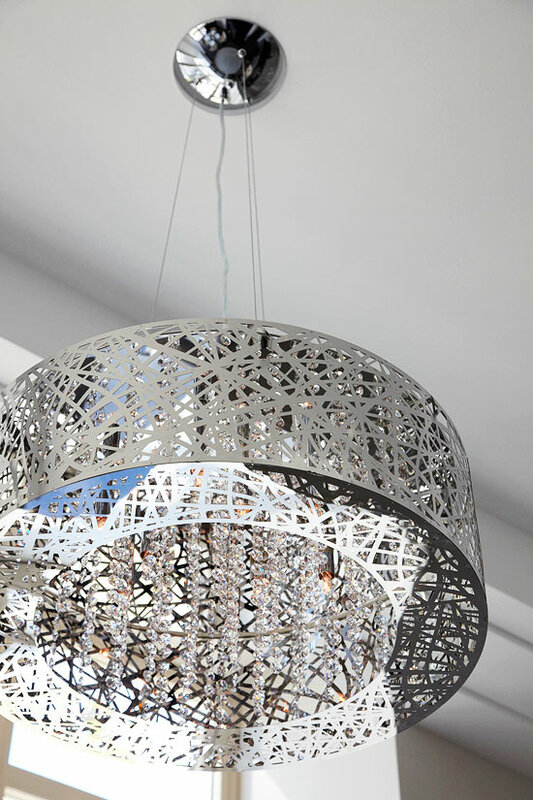 At night the light plays on the dining room chandelier, which is by Bocci. The dining room’s area rug, called “Streets of Paris,” is by Tufenkian. Oranges laid simply on the sideboard look just right. The sideboard, called “Nota Bene,” is by Van Rossum. 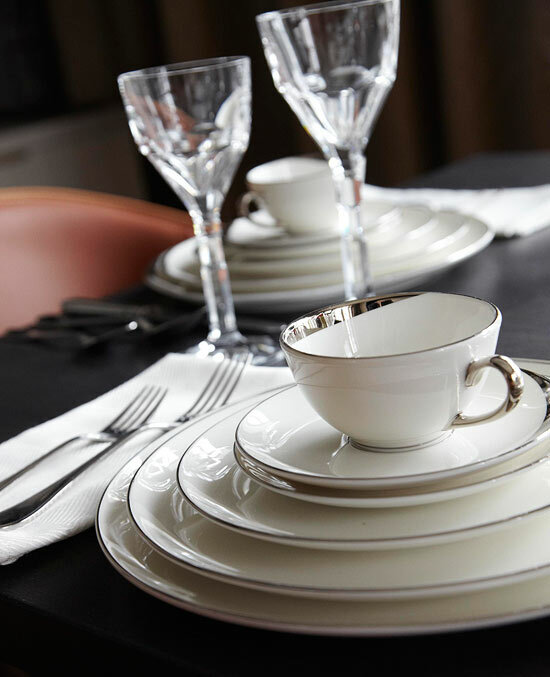 White china and Baccarat crystal catch the light in this classic table setting. The dining room takes full advantage of the apartment’s wonderful view. The art on the window is called “Fragments of Fire” by Janette Kerr. Not only does a casual breakfast area help the apartment multitask, but it also takes advantage of the city view. 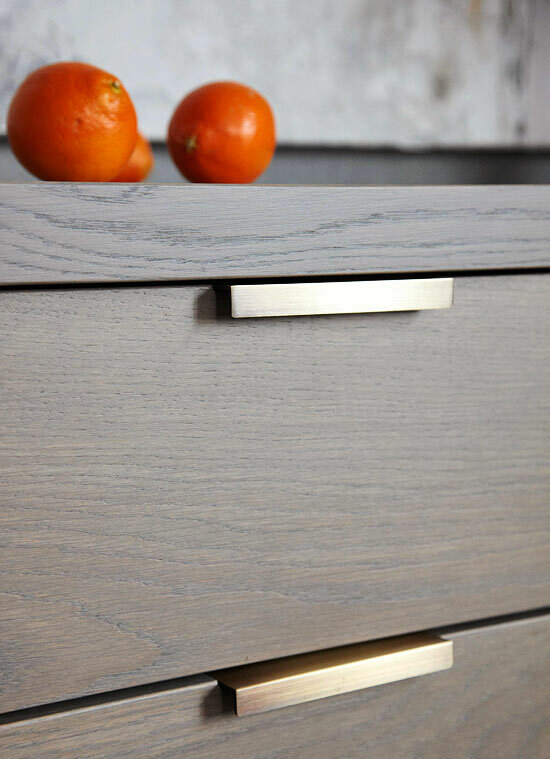 Cabinetry (“SieMatic BeauxArts.02”/Truffle Grey Gloss Lacquer); hardware (polished nickel): De Giulio Kitchen Design, 847/256-8833, degiulio.org. Countertops and backsplash (Maroon Cohiba Granite with polished finish): Acorn Tile Co., 773/463-5608. Chandelier over island (“ET2”): Kenneth Ludwig Home Furnishings, 312/467-0530, kennethludwig.com. Chairs (“Fitzgerald Low Back”/Creta #53): Poltrona Frau USA, 212/777-7592, poltronafrau.it. Paint (“Super White”): Benjamin Moore & Co., 888/236-6667, benjaminmoore.com. China (“Naxos” by Bernardaud); flatware (“Origine” by Christofle): Bloomingdales, bloomingdales.com. The light fixture adds urbane style to the kitchen. The arches lend a classical architectural touch. Soft lighting confers a touch of mystery and hints at more beyond. Wallpaper (“Chandbali”/Cinder #W518/02, by Villa Nova): Romo, 800/338-2783, romo.com. Headboard; bed cover; window treatments: custom design by Doreen Scott, Kinari Design, Kinari Design Ltd., kinaridesign.com. Headboard fabric (“Orbit”/Spacedust #Z100/03, by Zinc); bed-cover fabric (“Orbit”/Truffle #Z100/04, by Zinc); border (“Lunar”/Linen #Z162/04, by Zinc): Romo, 800/338-2783, romo.com. Pillow shams: Donna Karan Home Collections, donnakaranhome. Bedside tables, chest of drawers (custom): Van Rossum, vanrossummeubelen.nl. Bedside table lamps (“Cologne Lamp”/Umber #GLB49, with taupe silk shade): Porta Romana, portaromana.co.uk, through Donghia Chicago, 312/706-7071. Chair (“Brooklyn”): Poltrona Frau USA, 212/777-7592, poltronafrau.it. Art over chest of drawers (Hill of Olives, by Deborah Tarr): Cadogan Contemporary Gallery, cadogancontemporary.com. Drapery (“Lunar”/Tungsten #Z162/07, by Zinc); Roman shades (“Exner”/Shingle #Z205/1, by Zinc): Romo, 800/338-2783, romo.com. Mattress (Sealy Sleep Experience): Sealy, sealy.com. Carpet (“Smoke Tree”): Stark Carpet Corp., 212/752-9000, starkcarpet.com. Paint (“Balboa Mist” #OC-27): Benjamin Moore & Co., 888/236-6667, benjaminmoore.com. 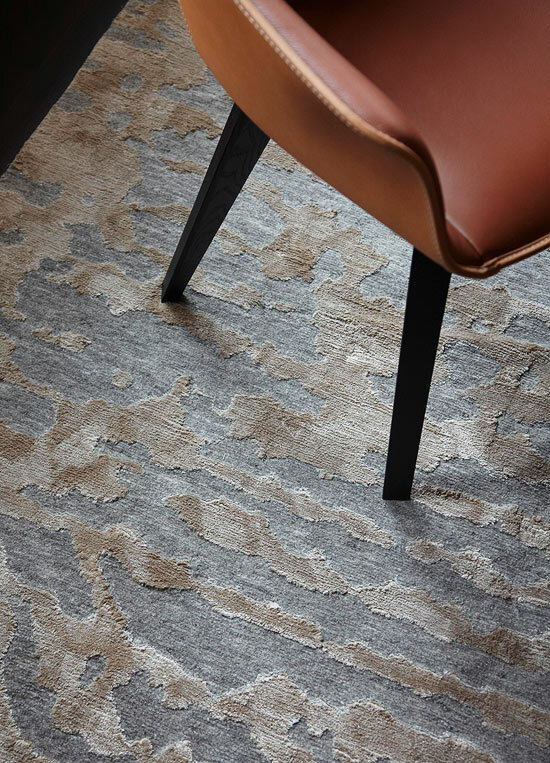 The designer has recently moved away from using rugs on wooden floors and toward using plushy carpets instead. 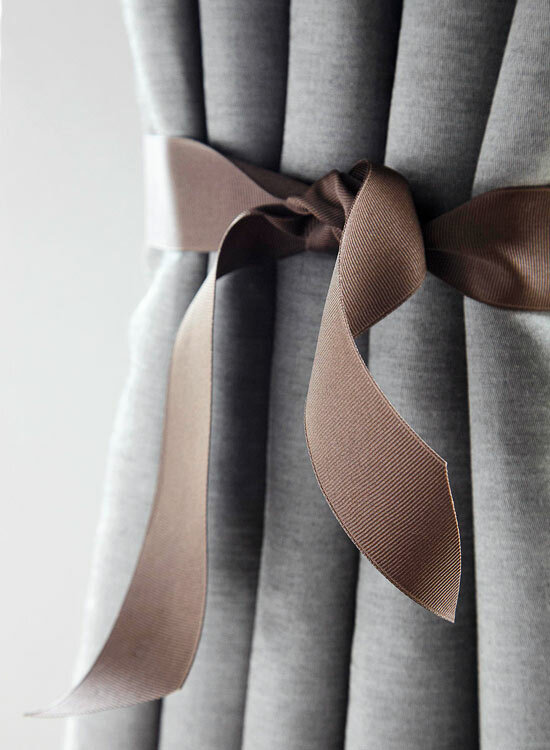 Chocolatey grosgrain ribbon used to tie back the taupe drapery is a nice touch. 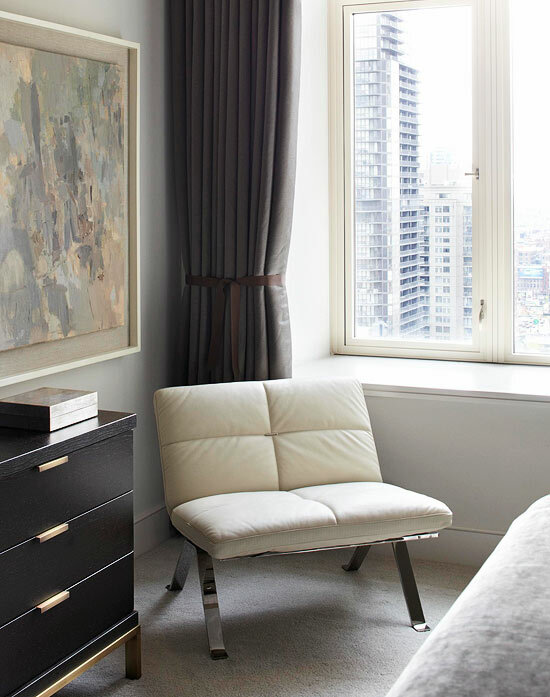 A stylish chair in a quiet corner, illumined by daylight, makes a nice place to read. 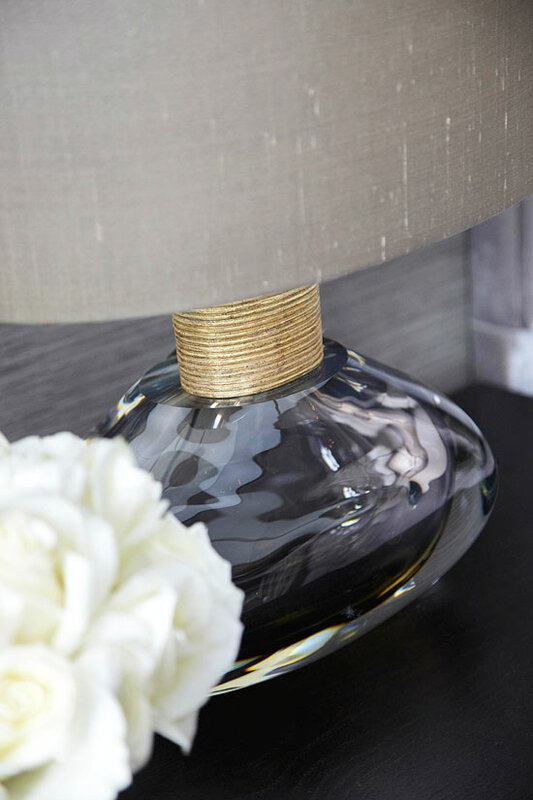 The glossy table lamps with taupe shades—providing yet another reflective surface—are by Porta Romana. Cabinetry (“SieMatic BeauxArts”/Magnolia White Matte Lacquer); cabinetry hardware (Polished Nickel): Giulio Kitchen Design, 847/256-8833, degiulio.org. Countertops and backsplash (White Onyx with polished finish): Acorn Tile Co., 773/463-5608. Wallpaper (“Mosaic”/Chamois #W339/02, by Romo): Romo, 800/338-2783, romo.com. Paint (“Cumulus Cloud” #1550): Benjamin Moore & Co., 888/236-6667, benjaminmoore.com. Area rug: Crate & Barrel, 800/967-6696, crateandbarrel.com.